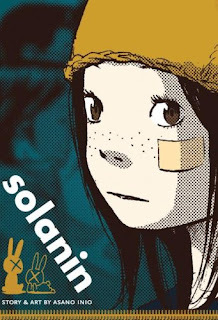 If there is one word you don't expect from a review of a "seinen" (men's) manga, it is "beautiful," but such a word only begins to describe Inio Asano's Solanin, a one-volume manga series that breaks down conventions with graceful, effortless ease. Through the stark, cinematic power of manga, he creates characters that leap from the page with every pang of joy and sadness. Meiko Inoue has recently graduated from college, but in her eyes, life is going nowhere fast. Her guitar-playing boyfriend, Taneda, is crashing at her Tokyo apartment while he works away at his part-time graphic design job and she endures the banality of office life. Still swept up in their youthful dreams, Meiko and Taneda find themselves increasingly dissatisfied and are left wondering where their adult lives could possibly take them. Solanin maintains a tight cast of supporting characters who enhance the depiction of Meiko and Taneda's relationship, including their cool-headed friend "Rip," their big, awkward buddy Kato, and his girlfriend Ai. Their interactions are quite often funny, but in a completely natural (and rarely laugh-out-loud hilarious) way that shatters the fake "slice-of-life" depictions of series such as Azumanga Daioh. The comic often feels like a window into someone else's life, with which you are able to watch all of the brief moments of happiness that they share with their friends and family. And cue the drama! Where Solanin really picks up is in its dramatic segments, featuring close-up shots of the characters' faces and showcasing Asano's impeccable sense of composition. His use of wide, thin panels and full-page shots shows an innate knowledge of how to pull emotion out of the simplest of scenes. For example, in one of the earliest chapters, Meiko comes home to find a balloon tied to the balcony of her apartment. She reaches for the thread that attaches it to the railing, but the balloon unravels and flies away into the sky. This comes right at the end of the chapter, and serves as a powerful piece of symbolism for Meiko's decision to quit her job. The drama just keeps ramping up from there through a series of big reveals, though in the grand scheme of things, they are nothing on the level of the epic revelations often portrayed in manga. Still, events like Meiko quitting her job or Taneda restarting his college band are huge events for these young people, who are desperately struggling to find anything in their adult lives that they can believe in. Outside of its incredibly down-to-earth plot, Solanin also doesn't skirt on the visuals. The backgrounds are detailed — though not particularly distinctive — views of the sprawling city of Tokyo, and Asano's character designs are almost all very attractive. The most especially appealing of the bunch are Meiko and Taneda, a fact that helps readers to feel for this couple and the challenges they face. Solanin is a breath of fresh air from the melodrama of many manga series. It combines honest, slice-of-life comedy with human drama, moderated by a sense of how real people react to their daily struggles. Never too ridden with pathos, Solanin walks the very line that most people do throughout their lives, playing the balancing act between the sorrows and the joys of life. It is a beautiful achievement of the graphic novel medium, and a testament to the power that true slice-of-life manga can have on a reader, if executed correctly. This review is based on a Viz Media graphic novel purchased by the reviewer.